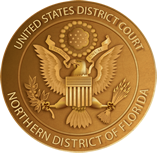 Jurors in the Northern District of Florida are selected at random from the certified list of registered voters from Florida's Secretary of State. One must be a registered voter and reside for one year within one of the four divisions of the Northern District of Florida. In the Northern District of Florida, juries for every case to be tried during a term of court are selected on the first day of the term on which jurors report for jury service. Except in very rare instances, no person will serve on more than one jury. If a person is not selected to sit on any juries on the first day of a term, he or she will not have to return to the court for further service during that term. To begin a jury trial, a panel of prospective jurors are summoned. This panel will include a number of persons from whom a jury will be selected to try the case. Alternate jurors may be chosen to take the place of jurors who become ill during the trial. The panel members are sworn to answer questions about their qualifications to sit as jurors in the case. You will be asked to fill out a short questionnaire. This helps the parties learn about you and will reduce the amount of time you must spend in court answering questions in person. This questioning process is called the voir dire. This is an examination conducted by the judge and sometimes by counsel or both. A deliberately untruthful answer to any fair question could result in serious punishment to the person making it. The voir dire examination opens with a short statement about the case to inform the jurors of what the case is about and to identify the parties and their lawyers. Questions are then asked to find out whether any individuals on the panel have any personal interest in the case or know of any reason why they cannot render an impartial verdict. The court also wants to know whether any member of the panel is related to or personally acquainted with the parties, their lawyers, or the witnesses who will appear during trial. Other questions will determine whether any panel members have a prejudice or a feeling that might influence them in rendering a verdict. Any juror having knowledge of the case should explain this to the judge. After the voir dire is completed, the jurors selected to try the case will be sworn in by the clerk who is to administer the oath. That official slowly, solemnly, and clearly repeats the oath. The jurors indicate by their responses and upraised hands that they take this solemn oath. Jurors not wishing to take an oath may request to affirm instead of swear. The trial proceeds when the jury has been sworn.